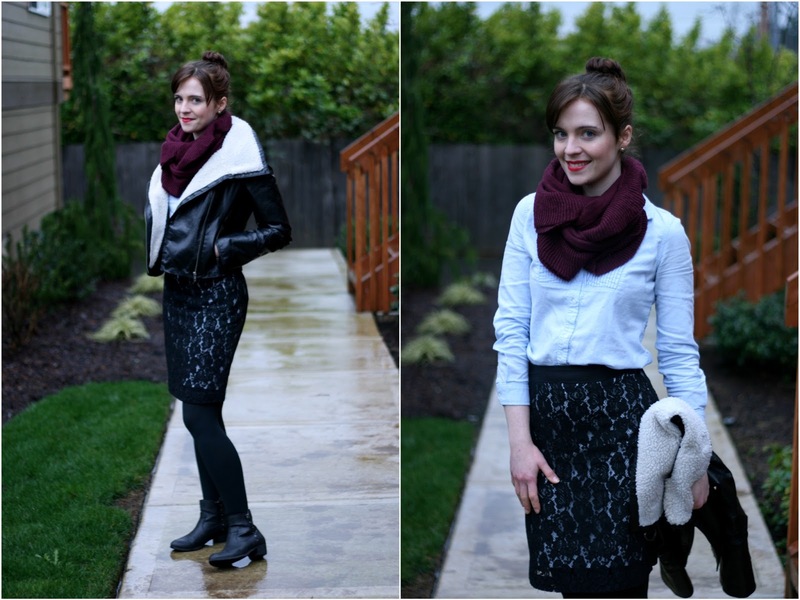 How to Wear DIY: The vintage lace remade skirt and pleather! 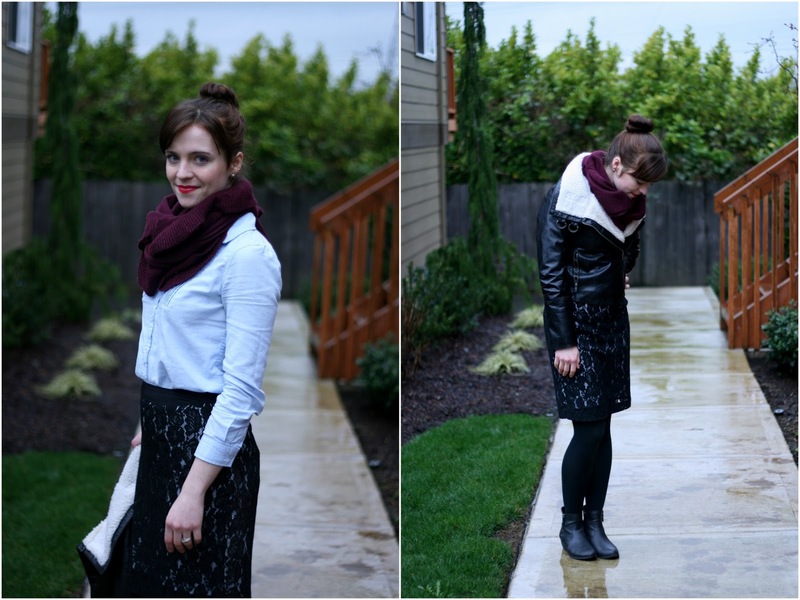 I love when I can combine vintage and trendy contemporary style, and of course also a homemade piece! So here goes... voila the skirt that I made out of a vintage shift dress in a outfit I wore to work and then date night. I love this skirt and really should wear it more! It's awesome chunky black lace, nice and substantial. So I didn't feel weird wearing it with my cozy black pleather and fur jacket and motorcycle booties. ;) Also been loving lace with chambray, and I pretty much live in basic blue button-ups, so love getting a chance to dress mine up. Jacket: Ross (similar). Scarf: gift, H&M. Shirt: Old Navy (similar). Boots: Forever 21 (similar/similar). 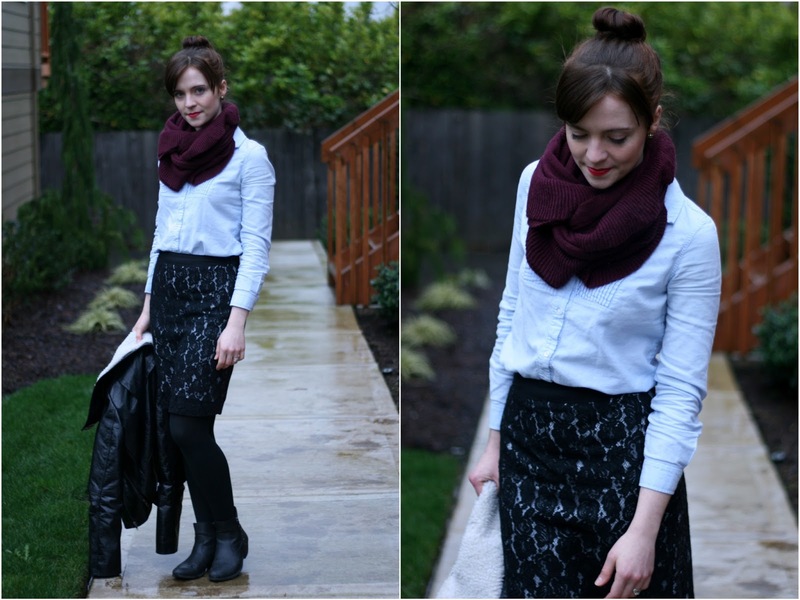 Skirt: DIY, from a vintage lace dress! What a fun skirt! I have a store-bought lace skirt, which is pretty similar to yours, but the lining is black and it's hard to appreciate the details unless you're close up. Very sleek! That is a beautiful skirt. You look fantastic! Aren't you so exciting about the weather change? Bring on the warmth! That skirt is fantastic! I like that it can be dressed up or down! Whoa! Check out the new commenting set up. I love the bottom portion that includes stuff you also wrote. Very neat. Love the skirt... you look fab, as usual! great combo! and i love the scarf, too.